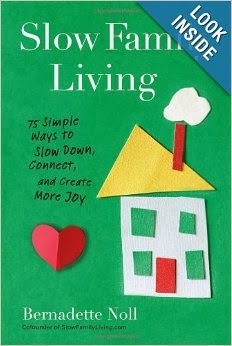 Behold & Reflect: Review of "Slow Family Living"
My life is anything but slow. Between cooking, cleaning, clothing, diapering, wiping, burping, bathing, transporting, disciplining and putting to bed (sometimes multiple times) three children, there's not a lot of time to "take four slow deep breaths" as blogger Bernadette Noll suggests in the third mini-chapter of this book. But I do long for a life that isn't so frenzied and so driven by our be-busy-or-be-worthless culture. I want to live intentionally and to savor the truly important bits of motherhood. The title of this book, "Slow Family Living," seems to borrow vocabulary from the Slow Food Movement-- an effort to cook and eat fresh, locally grown and organic produce and to use techniques that hearken from a slower, simpler time. I thought Noll's book might be the parenting version of slow foods, but its is less about doing family the slow, old-fashioned way and more a collection of 75 activities, questionnaires and exercises to refocus your attentions on your family and to make the members of your family the centerpiece in everything you do in daily life. The 75 ideas in this book fell into a few categories for me. #10 Listen with Your Heart Open - Really listening to your kids/spouse without interjecting. #15 High Point-Low Point - Before bed, review the day and ask them their best and worst moments. #16 The Blitz: A Family Tidy Up - Set a timer for 15 minutes of whole-family frenzied cleaning of the house. #17 Spend Nothing Day - Just what it sounds like. #27 Do-Over - Train kids (and yourself) to request a "do-over" when you hear yourself say something unkind. #36 Just Ten Extra Minutes - Plan 10 extra minutes into every activity or transition so that you don't have to hurry around like a madwoman herding cats. #42 Sigh. Forgive. Let Go. Move On. - Again, pretty self-explanatory. #55 Out with the Old - Each member of the family gets rid of one thing each day in December leading up to Christmas. #22 Go Outside and Play - Everyday above freezing, and sometimes below freezing, our boys are out there. #34 Keeping a Family Journal - I think my other blog, The Daily Munchie, counts for this. #63 Dance Party Rock Band - We call ours a "Robot Dance Party" and play Daft Punk. #68 DEAR (Drop Everything and Read) Time - I really had no idea this was a thing. And with a clever acronym to boot! #71 Don't Sweep Until the Rice Dries - Except in my house, it's don't sweep until the macaroni has dried and been stepped on enough times to dislodge it from the floor. #23 Camp Out at Home - Pitch a tent in the backyard on a weeknight. #50 A Night in the Park - Noll's family meets weekly with three other families at a local park to eat, chat and play the night away. I hope our family could be so blessed some day. #9 Dropping Love Bombs - Kind of the group hug equivalent of dinging your glass at a wedding. Just not my thing. #65 The Family Lemonade Stand - Or not. #67 Freaky Friday - I hate that kind of movie, so I can only imagine the discomfort reenacting it with my children would bring. OK, so I just summarized a quarter of the book for you :) Now a few minor criticisms: I think if you are drawn to a book called "Slow Family Living," you'll find that the concepts in this book will reinforce your parenting philosophy, but won't necessarily lend any earth-shattering new insights. You might also be frustrated if you don't have ready access to things like Noll's hometown of Austin, TX, readily offers, like a corner store within walking distance or plentiful public parks. (But, maybe if one is serious about slow family living, moving to a location that makes it possible is a serious consideration?) I also found some of the suggestions were a little too touchy-feely, pop-psychology for my personal tastes. Noll's writing style was also a tiny bit of a distraction for me, as she ends most chapters with a chirpy cliche like: "That's a win-win-win!" or "And who doesn't need more love?" But I'd probably like her better in person than in print. Overall I recommend this book to someone looking for ideas to help enjoy family life more. I found that reading Noll's suggestions got me in the frame of mind to keep trying new things with my family to see what can help me connect more fully despite this frenetic age.